Does anyone read Acknowledgments? I mean, I know that some folks do, but I doubt there are many young readers among that number. We knew that the Acknowledgments section was a useless body part, a pretentious sixth digit, folderol to skip past, along with Forwards and Prefaces and Introductions and (the aptly named) Appendixes. The story was elsewhere and that’s all we wanted, thank you very much. In any event, an alert acknowledgment-reader might note that I mentioned Jack Rightmyer’s mustache as a source of inspiration for my new middle-grade book, Justin Fisher Declares War!, due for release August 1, 2010. Here is the mustache in question, attached to the face of a young, first-year teacher who is desperately trying to look all growed up. Definitely a Groucho Marx thing going on here, as if it were smeared on with greasepaint. At the time of that interview, I was in the beginning stages of writing Justin Fisher. Early on, I knew the book would turn on a contentious relationship between a teacher and fifth-grade student. At first, the teacher was classically bad — and pretty one-dimensional. It wasn’t working. My conversation with Jack helped me see that teacher in a sympathetic light, humanized him for me. The teacher, Mr. Tripp, was struggling just as much as Justin, both unhappy, both trying to be something they weren’t. 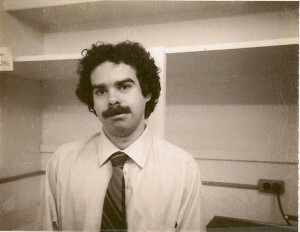 By mid-October, the mustache was fully formed, brown bristled, thick as a push broom. “Why’d you grow it?” Justin persisted. Teachers had no idea how uncomfortable it was to sit in those hard wooden chairs. It was impossible to sit up straight all day long — but that was exactly what Mr. Tripp expected. Sit down and be still. How could anyone survive fifth grade without going a little crazy? Justin’s solution: to tip his chair as far back as possible. He’d lean it on two legs, lift his hands off the desk, balance there for as long as he could, then catch himself at the last second. It was a habit that inspired Mr. Tripp to create The Justin Fisher Rule: All four chair legs on the floor at all times! After that, Justin had to pick his spots. The problem with Justin’s daredevil game was that when he pushed it too far, the chair crashed to the floor. Hey, it was usually good for a laugh. That’s Jack’s book, above; product description, below. Addressing the daily challenges that new teachers face in front of a class, this humorous, personal account shares the lessons learned from one mans lengthy teaching career. Imparting practical advice in an engaging manner, these truthful tales transport readers through a wide array of settings—urban and suburban schools, from sixth grade through college. Future educators will discover methods for using levity to build trust with their students and learn how to detect and avoid common pitfalls in the classroom. 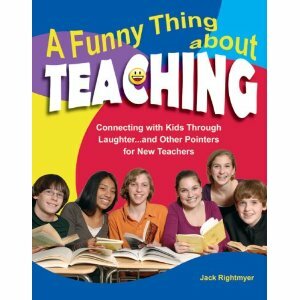 Offering advice on discipline, testing, bullying, and coaching, this memoir provides a fresh perspective on maintaining control of the class, while sharing the importance of using humor as a way to brush off the minor stresses of the job. Category: Justin Fisher Declares War!, the writing process / Tags: A Funny Thing About Teaching, Jack Rightmyer, James Preller Interviews, Justin Fisher Declares War!